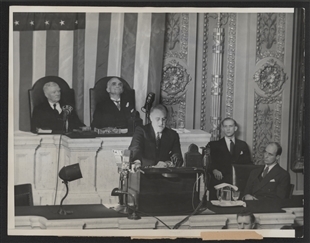 On January 3, 1936, President Franklin D. Roosevelt gave the first State of the Union address delivered in the evening. Designed to reach the largest possible radio audience and modeled after his famous “fireside chats,” the address touted the administration’s accomplishments and lambasted critics of the New Deal. 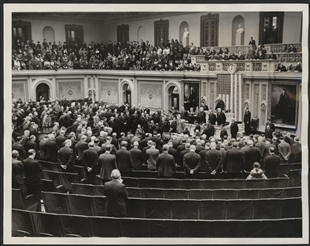 The first nighttime presidential address was Woodrow Wilson’s April 2, 1917, appeal to a Joint Session of Congress for a declaration of war against Germany.